If the winter weather has you feeling down and you feel like these dreary days will never end, then you could probably use a mood boost. There are so many ways that you can create a happier day for yourself, relieve stress and alleviate feelings of anxiety and depression, that it was hard for us to choose just 10. Keep reading to find out what our favorite mood-boosting ideas and activities are and how you can use them to lift yourself up. Writing can help bring clarity to your current situation, so if you are feeling confused about your feelings, keeping a journal can help you sort the situation out. Another way you can write daily to boost your mood is to keep a gratitude journal. Each day, write down two to three things that happened that day that you enjoyed or were particularly grateful for. No, don’t head to the bar in the name of a mood lift. Instead, head to your kitchen to make a cup of tea. 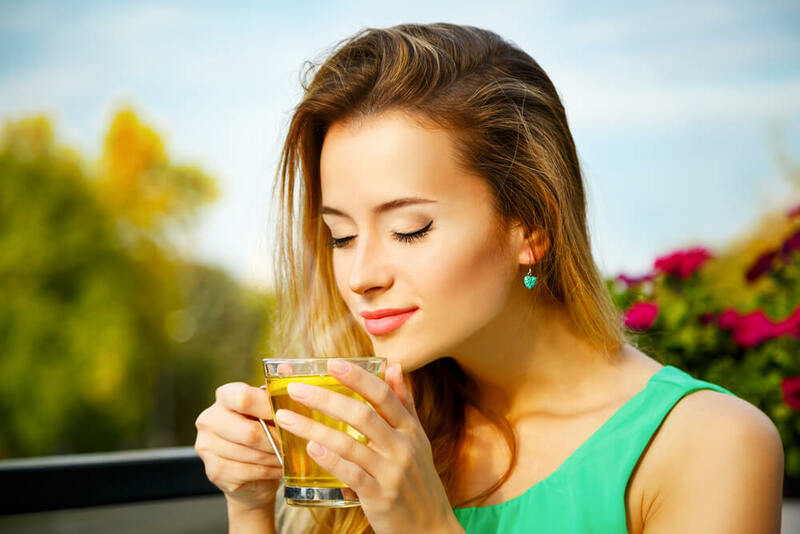 Green tea contains chemicals that fight depression and anxiety, as well as a healthy dose of antioxidants. You could also drink some hot water with freshly squeezed lemon juice, because the scent of lemons can reduce feelings of stress and anxiety. Never underestimate the power of a good night’s sleep, particularly where your mood is concerned. Without enough sleep, you experience feelings of fatigue and exhaustion in addition to irritability and anxiety. The National Sleep Foundation recommends that the average healthy adult gets between seven and nine hours of sleep each night, even on the weekends. You may have noticed that during the past year adult coloring books have become increasingly available and popular. Sitting down with a coloring book and some gel pens or colored pencils can help you to calm down and relieve feelings of stress and anxiety. Sometimes when your emotions are high, you crave for junk food and when you give in, you end up feeling even worse than you did before. The next time you crave for those potato chips, grab a handful of walnuts instead. Sure, they may not taste anything like potato chips, but they keep you full and feeling satisfied. Additionally, walnuts help boost your mood naturally by affecting the neurotransmitter, serotonin. It may seem odd to include shopping on a list of positive ways to boost your mood, but if you spend wisely, shopping really can lift your mood. Researchers surveyed shoppers at a mall and found that those that bought experiences – a great meal, concert tickets or tickets to the movies – were far more satisfied than shoppers who spent their money purchasing items like shoes and clothes. We already discussed that sunlight helps to keep your mood high all day, but sunlight isn’t the only benefit to going outdoors. Breathing in fresh air is refreshing for your body and provides most people with an instant lift, and being around nature and greenery can significantly improve your mood as well as increase productivity and mental clarity. Clutter can make you feel way worse about yourself and your current situation, because it reminds you that you aren’t taking care of things you should be and this can make you feel like a failure. Simply reorganizing papers on your desk of folding clothes rather than throwing them on the floor can go a long way in helping you feel like you’re taking control, which boosts your mood. When you first wake up in the morning, open your curtains and start your day off with some sunlight. “Brightening up your bedroom when you wake up helps you feel happier all day,” says Michael Terman, Ph. D. and the director of the Center for Light Treatment and Biological Rhythms at Columbia University Medical Center. A study conducted by the University of Missouri – Columbia noted that people who spent just 15 minutes a day petting a dog experienced the release of the feel-good hormones serotonin, prolactin and oxytocin. In addition to increasing these “happy” hormones, petting a dog was also linked with a reduction in the stress hormone, cortisol. Studies using kittens found the same result, so it doesn’t seem to matter if you are a dog or a cat person. Keeping a smile on your face can help bust you out of a bad mood, and sometimes looking at a situation differently is all you need to get through it. Practice these 10 mood-boosting ideas any time you need a little bit more happiness and peace in your life.